THE 1984 MULTI-PLATINUM SMASH ALBUM FEATURING THE BIG HITS "ROUND AND ROUND" "WANTED MAN" "BACK FOR MORE" "I'M INSANE" & "LACK OF COMMUNICATION"
SEVERAL TUNES FEATURED IN THE CRITICALLY ACCLAIMED MOVIE "THE WRESTLER"
Ratt have been making very loud and credible heavy metal rock albums now for decades. The San Diego quintet built a local club following throughout the early eighties and flourished into a mega-platinum recording act for Atlantic Records with their debut smash recording "Out of the Cellar." The "Out of the Cellar" album features 10 hard hitting rock masterworks like their top charting hit singles "Round and Round" , "Back for More" and "Wanted Man" as well as a plethora of metal radio classics like "The Morning After", "She Wants Money" , "In Your Direction" and the ever popular metal album closer "Scene of the Crime." "Out of the Cellar" was also a home run for their huge video audience, as "Round and Round" was an MTV smash video hit and featured the antics of Stephen Pearcy’s famous uncle the late great Milton Berle. Featuring the dynamic vocals of Stephen Pearcy, the dual guitar attack of Warren DeMartini and Robbin Crosby, the blistering bass of Juan Croucier and the powerful drum work of Bobby Blotzer, Ratt’s "Out of the Cellar" album is still the go to choice for many heavy metal fans as the band continues to be a major force in the music industry. 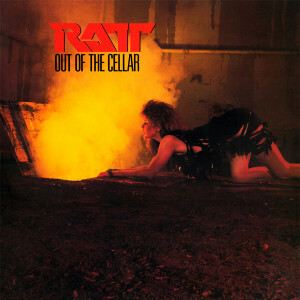 Friday Music is very pleased to announce another heavy metal classic with the debut top five, multi-million selling album "Out of the Cellar" by Ratt. Impeccably mastered from the original Atlantic Records tapes by Joe Reagoso (Deep Purple/Alice Cooper/Queensryche), and pressed for a very limited time on 180 Gram Translucent Audiophile Vinyl, please join us in welcoming back this stellar Ratt release, as it will be one of the most anticipated heavy metal audiophile releases this year. Ratt… "Out of the Cellar" …First Time Translucent Gold Audiophile Vinyl…Limited Edition…An Exclusive…Only from your heavy metal and hard rock friends at Friday Music.